In this tutorial I will show you how to use different blending modes to blend flying hairs easily and to make semi-transparent planet. I'll also show you different techniques of adjustment to get the most realistic results in your photo manipulations! Editor's Note: This tutorial is inspired by this Earth Day - Green Planet artwork, by AlexandraF, which you can learn how it was created in this Photoshop tutorial. Further information about this inspiration is found in this blog entry. Before we start download all the necessary pictures (girl, background, earth, tree, apples and moon) and brushes (glitters and clouds). Open the photo with the girl. Right-click on the "background" layer and select Layer From The Background, which unlocks the layer. Name the layer "GIRL." Now open the picture of the background and drag it into the picture with the girl and name it "BACKGROUND." As you can see the background is smaller than the photo of the girl. To make it bigger click on the layer "BACKGROUND," preset Command + T, and while holding Shift make it bigger. If you hold Shift, proportions of the picture stay the same. Place the "BACKGROUND" under the "GIRL" and make the "GIRL" layer invisible. Before blending these two images together we will work on the background a little bit. If you look at the "BACKGROUND," you can see that the quality of the image is quite bad because of resizing. Go to Filter > Blur > Gaussian Blur and set the Radius to about 1px. It will be a little blurry, but it really doesn't matter. Press OK.
Now make the background darker - add Adjustment Layer Levels. The button Create New Fill or Adjustment Layer can be found on the bottom part of the Layers palette. If you don't see the Layers palette, then press F7 and it appears. In the dialogue window Levels set the Input Levels on 34; 0,82; 255 and press OK.
As you can see in the preview image the background isn't reddish but blue. To change your background add a new layer above the "BACKGROUND" layer and adjustment layer Levels and name it "BLUE TONES." Grab the Gradient Tool (G), pick this color #1f79a3 and fill the layer with it. Now change the Blending Mode of the layer to Color and set the Opacity to 80%. Blending flying hair is always difficult because there is no easy or quick way to do it. But in case that you have a stock photo with a light background and want to blend it with a dark background, there is one trick you can do really quickly only by changing blending modes. Duplicate the "GIRL" layer, name it "FLYING HAIR" and place it under the "GIRL" (which should still stay invisible). Now change the Blending Mode to Multiply (you can also use Blending Mode Darken if Multiply looks too dark). Add a vector mask to this layer and with a black brush paint over all the parts of the layer except the hair to make them invisible. Make the "GIRL" layer visible. You need to cut out the background of the layer. There is many ways how you can do it. Use the technique that you're most comfortable with. But remember to cut everything very carefully. I know it can be boring to do it, but if you make it sloppily the result will never look realistic. You don't have to care about the hair much because we've prepared that in the previous step. After cutting out your picture it should look like the image below. The girl has ugly shadows under her eyes, cheeks and nose, from the lighting cast during the shooting of this photo. In this step we'll remove these shadows. Add a new layer above the "GIRL" and name it "RETOUCH." Right-click on the layer and select Create Clipping Mask. Now grab the Stamp Tool (S), select a soft, round brush and set the Opacity on 20%. Press Alt and click on a lighter area of her face to set the place from where the skin will be duplicated. Then paint over the areas with shadows (areas which are circled in the picture below). Change the source of the cloning from time to time to get a more natural result. 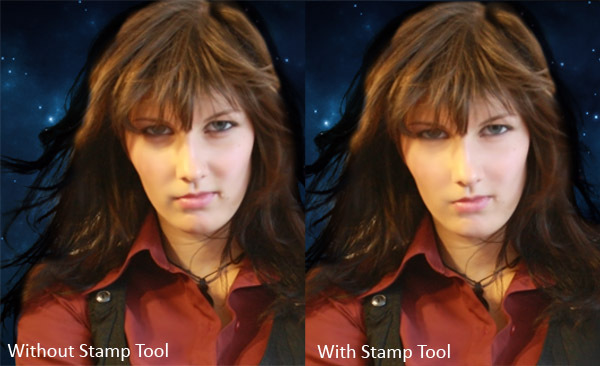 In the picture below you can see how the face looks before and after using the Stamp Tool. It's obvious that the girl doesn't fit the background. We'll fix that during this step by using several adjustment layers. At first we will remove the yellow light from the light bulb. Add a new Adjustment Layer Hue/Saturation and make a clipping mask from it. Set Edit on Yellows and lower the Saturation to -54. Now we'll make the girl bluer. Add a Color Balance Adjustment Layer, make a clipping mask from it and set it as you see in the pictures below. To make it even bluer add a Gradient Map Adjustment Layer. Don't forget to create a clipping mask from it. For dark tones select a dark blue color (I used #072519) and for light tones use white. Press OK and lower the Opacity to 30%. And one last thing for now - we will increase contrast. Add a Levels Adjustment Layer, create a clipping mask from it and set the Input Levels to: 33, 0,73, and 238. Press OK. This is just a quick step, let's brighten the eyes. Add a new layer above the "GIRL" and all clipping masks and name it "BRIGHTEN EYES". Grab the Gradient Tool (G), pick #808080 as the color and fill the layer. Then change the Blending Mode to Overlay. Select a soft, round brush at a size that is similar to the size of the irises, pick a white color and paint over the irises. It makes them brighter. Open the picture of earth and drag it into the manipulation. Name the layer "PLANET." As you can see the planet is too big. To make it smaller press Command + T and resize it. Hold Shift to constrain proportions while resizing. Cut out the background of the planet. Let's add two layer styles: Inner Shadow and Outer Glow. The Add Layer Style button is located at the bottom part of the Layers palette. Add an Adjustment layer of Hue/Saturation above the layer "PLANET" and set the value of the Hue to +90 and Saturation to -20. Press OK and make a Clipping Mask from this layer. Change the Blending Mode of the "PLANET" to Hard Light. It makes it semi-transparent. In this step we will add the tree. Open the picture of it. Go to Select > Color Range. Then click on the white background which will select it. Press Command + Shift + I. It makes inverse selection. Drag this selection into the photo manipulation above the "PLANET." Name the layer "TREE." Press Command + T and resize the tree on the proper size. Don't forget to hold Shift during the process so proportions stay the same. As you probably see the selection should be better. It's again not hard to fix it. Command click on the thumbnail of the tree. It activates the mask of the layer. Now go to Select > Modify > Contract and set it to 2 px. Press OK. Now press Command + Shift + I (inverts the mask) and then Delete which will remove the unwanted parts. Add a Levels adjustment layer above the "TREE" layer and set the Input Levels on 21; 1,12; 232. Press OK and create a clipping mask from this layer. Then add a Color Balance adjustment layer and set it as you can see below. In this step we will make the place around the planet brighter to catch the viewer's attention on this place. Add a new layer under the "PLANET" and name it "GLOBAL LIGHT." Grab the Gradient Tool (G) pick #808080 color and fill the layer. Now go to Filter > Render > Lighting Effects and set the dialogue window as shown. Notice that I place the brightest spot from the center to the place where the planet is. Now change the Blending Mode to Overlay. It changes the light of the manipulation. I also used this layer to make the eyes even brighter. Grab the Brush Tool (B), select a soft, round brush with a Diameter similar to the size of the pupils, pick white for the color and paint on this layer over the girl's pupils. It makes them brighter as shown. In this step we will add clouds. Install the clouds brush you downloaded. If you don't know how to do that look at this tutorial. Add a new layer on the top of the layers and name it "CLOUDS." Pick white for the color and paint some clouds around the planets. You can paint them around the tree and girl's hand as well. It's completely up to you and your taste. Once you're finished duplicate "CLOUDS" and change the Blending mode of this layer to Screen. This step makes the clouds nicely white, not grey. One more thing which must be done is adding shadows. It's really easy. Duplicate the "CLOUDS" once again and place this layer under the "CLOUDS." Command-click on the thumbnail of this new layer. It activates the mask of the layer. Grab the Gradient Tool (G), pick a black color and fill the selection. Now move the layer a little bit to the right and lower the Opacity to 25%, which gives it a more realistic result. Open the picture of the moon, cut out the background, and drag it into your manipulation. Place the layer on the top of your other layers and name it "MOON." Change the Blending Mode to Screen. Now we'll add an aura around the moon. Add a new layer under the "MOON" and name it "AURA AROUND THE MOON." Grab the Brush Tool (B), select a soft, round brush and pick a bright blue color. Lower the Opacity of the brush to about 15% and paint around the moon to make a nice aura. Open the picture of the apples. Select the apple in the front and drag it into the photo manipulation. Press Command + T, and while holding Shift make it smaller. Duplicate the apple several times and place it in different places of the tree. You can flip them and rotate them to get more variety. Once you're finished merge all layers with the apples into one and name it "APPLES." Now we have to blend them and add the shadow underneath. To blend them add a vector mask (the button Add Vector Mask is located at the bottom of the Layers palette in the same place as the Add Layer Style button, which we used a few steps back) to the layer. Now with a black brush, paint over some areas to make them disappear. Now add a Drop Shadow Layer style. Set it as shown below. Now we will change the lights and shadows so they fit better to the scene. Add a new layer on top of all the layer and name it "LIGHTS & SHADOWS." Grab the Gradient Tool (G), pick #808080 color and fill the layer with it. Change the Blending Mode to Overlay. Now grab the Brush Tool (B), pick white for the color and paint over the areas you think should be lighter. Use a lower opacity to make the light not so strong and a higher opacity to make it stronger. Lighten the pupils of the girl once again. Now pick a black color and paint over the area where shadows should be. Play with the opacity again to get more realistic results. Install the glitter brush you've downloaded before. Add a new layer on top of your layers. Name it "GLITTERS" and paint with the brush around the girl's hand a little. To separate the girl from the background a little we will add aura around her. Add a new layer under the "GIRL" and name it "AURA AROUND THE GIRL." Grab the Gradient Tool (G), pick #808080 color and fill the background. Change the Blending Mode to Overlay. Now grab the Brush Tool (B), select a soft, round brush, pick white for the color and paint around the girl. You can see what I mean below. We've already placed all elements so now we have to adjust the picture. At first add a new Gradient Map Adjustment Layer on the top of your layers and set it as you see below. Decrease the saturation of the picture. You can use an Adjustment Layer of Hue/Saturation or (like me) use the Gradient Tool. Set the Opacity of this layer to 60%. As you can see in the preview picture, the eyes are more saturated than the rest of the picture. We'll make it in this step. At first click on the vector mask of the adjustment layer with gradient and lower the opacity. Grab the Brush Tool (B), pick a black color and choose the same size of brush as the pupils are. Now paint over them. This step will remove the desaturation effect on the eyes. Now add a new Hue/Saturation Adjustment Layer and set the value of Saturation to +100. Grab the Gradient Tool (G), pick a black color and fill the vector mask of this adjustment layer. Then grab the Brush Tool (B), pick white for the color and paint over the pupils. It makes them even more saturated. Grab the Marquee Tool (M) and select the whole manipulation. Now go to Edit > Copy Merged and then press Command + V to paste the merged image. Place the layer on the top of all the layers. Go to Filter > Other > High Pass... and set the value Radius on about 5 px. Change the Blending mode of the layer to Overlay. The whole picture is sharper. But according to me the sharp background doesn't look nice and it should be without the High Pass effect. Grab the Eraser Tool (E) and erase this layer on the places where the background is, as shown below. This is the last time we change the lights and shadows. Paste the merged picture once again on top of all layers. Now press Shift + Command + U to desaturate the image and Command + I to invert colors. Go to Filter > Blur > Gaussian Blur and set the value radius on about 15 px. Press OK. Change the Blending Mode of this layer to Overlay and lower the Opacity to 30%. You are almost done. There are two easy things to fix. At first I think that the image should be little bit darker. To fix that add a new Levels Adjustment Layer and set the Input Values on 0; 1,1;255. Press OK.
Now add a Color Balance Adjustment Layer and set the Color Levels on -6; 0; +4 and press OK. That's all. Congratulation! You've just finished this photo manipulation. Hope that you've learned something new in this tutorial or found inspiration for your next photo manipulation. Have a great day and thanks for reading!